Stone Soup for Five: Are you too comfortable? 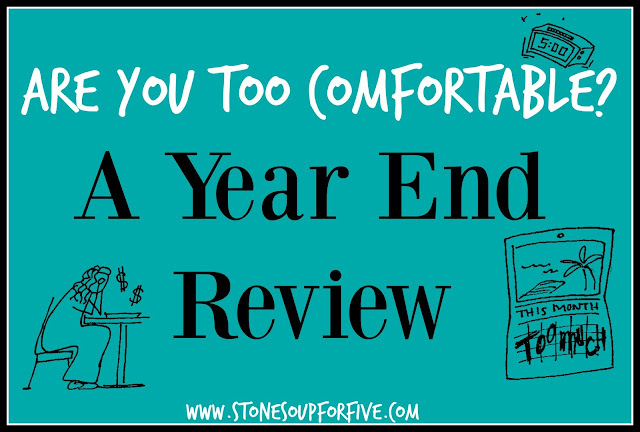 A year end review. Are you too comfortable? A year end review. I need to step back for a second and take a look at my comfort levels in some areas and figure out where I'm too comfortable. Then I need to be intentional and work out a plan to increase the urgency in the areas of life that are too important to live by default. In this culture of convenience, comfort, and entitlement, I need to purposefully check myself regularly to make sure I'm living this one life the best I can. If you haven't taken stock of where you are in each of these areas, do this along with me. In each category ask these questions and write down your answers (in a bullet journal, preferably)! Think of doing this as an outsider looking into your life. Don't allow guilt to creep in, try to be objective, as if you were a life coach, doing this for a stranger who was paying you. Where have I excelled in this area in the past? Where am I still struggling? Am I apathetic or uncommitted? Why? Am I developing habits in this area (good or bad), what are they? What step can I make TODAY to improve here? What can I do weekly? What can I do monthly? Write it all down somewhere where you won't lose it, as we'll revisit it soon. I highly recommend starting a bullet journal for 2016. (Basically a commonplace book from days of old. ONE place to store all your notes, thoughts, plans, goals, and schedules.) And the awesome part of it all is you can start one with a ball point pen and a composition notebook... but I digress. Review and rate yourself and let me know how it goes! I'll be doing the same! Love this post, will help make setting goals for next year. Now I know how I am going to use the last pages in this year's bullet journal!!! Thank you.